FORT WORTH, Texas, October 18, 2018 – BNSF Railway Company (BNSF) today announced Kiamichi Railroad Company as its 2018 ‘Shortline of the Year’ during its annual Shortline Conference. Kiamichi is a Class III shortline serving Texas, Oklahoma and Arkansas, interchanging with BNSF in Madill, Oklahoma. A subsidiary of Genesee & Wyoming, Kiamichi was recognized for its commitment to safety, service, growth, investment and velocity. Since 2012, Kiamichi has improved much of its 265-mile line to handle 286,000-lb. loads of traffic, including upgrading 150 miles of track and investing more than $35 million. 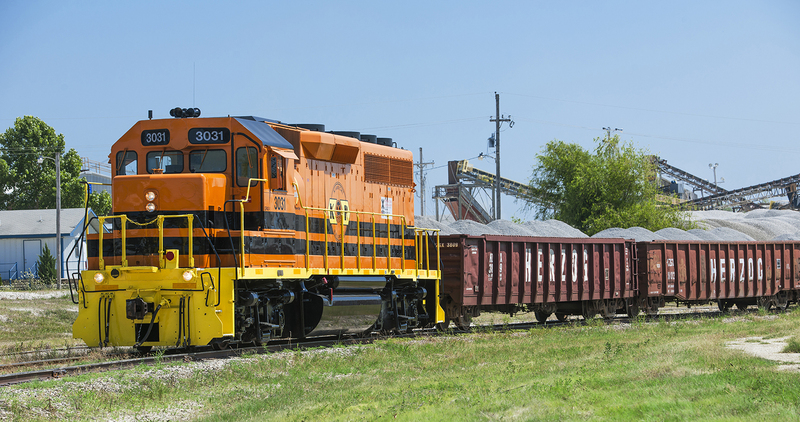 With BNSF, Kiamichi worked to capture market share in aggregates, fluff pulp and coal. BNSF also recognized Richmond Pacific Railroad Corporation (RPRC) for its commitment to safety and customer service. Operating out of Richmond, California, RPRC has a seven-year injury-free safety record, has upgraded rail, and increased capacity to facilitate additional business. The entire RPRC locomotive fleet has also been upgraded with modern power, which increases fuel efficiency and decreases their environmental footprint. Kiamichi Railroad Company L.L.C., a subsidiary of Genesee & Wyoming Inc. (G&W), is a 265-mile shortline railroad headquartered in Hugo, Oklahoma. The railroad transports commodities including coal, clay, concrete, food and kindred products, glass and stone, lumber and wood products, pulp and paper and non-metallic minerals. G&W owns or leases 121 freight railroads worldwide organized in nine locally managed operating regions with 8,000 employees serving 3,000 customers. G&W’s seven North American regions serve 41 U.S. states and four Canadian provinces and include 115 shortline and regional freight railroads with more than 13,000 track-miles. G&W subsidiaries and joint ventures also provide rail service at more than 40 major ports, rail-ferry service between the U.S. Southeast and Mexico, transload services, contract coal loading and railcar switching and repair. Richmond Pacific (RPRC) was founded in 2002 and operates 11.5 miles of track serving an industrial and port area in Richmond, California. RPRC handles over 20,000 cars per year of coal, chemicals, cement, waste, and other industrial products. RPRC is owned by Levin-Richmond Terminal Corporation. BNSF Railway is one of North America’s leading freight transportation companies. BNSF operates approximately 32,500 route miles of track in 28 states and also operates in three Canadian provinces. BNSF is one of the top transporters of consumer goods, grain and agricultural products, low-sulfur coal, and industrial goods such as petroleum, chemicals, housing materials, food and beverages. BNSF’s shipments help feed, clothe, supply, and power American homes and businesses every day. BNSF and its employees have developed one of the most technologically advanced, and efficient railroads in the industry. We work continuously to improve the value of the safety, service, energy, and environmental benefits we provide to our customers and the communities we serve.